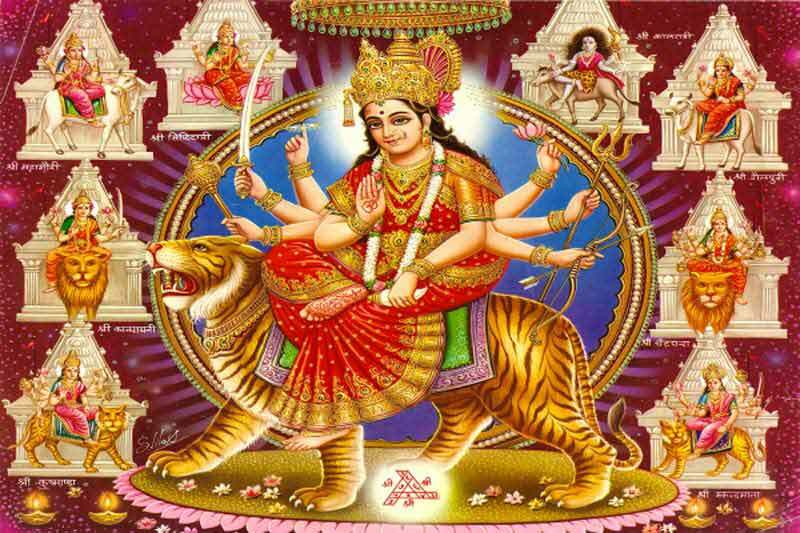 The nine goddess worshipped during Navratri are known as Nav Durga and they have hidden symbolism attached to them. The Navadurga are Shailputri, Brahmacharini, Chandraghanta, Kushmanda, Skanda Mata, Katyayani, Kala Ratri (Kaalratri), Maha Gowri and Siddhi Dayini. Goddess Shailputri is symbolically associated with Shradha (concentration, devotion, veneration and faith). Brahmacharini is associated with dispassion towards feelings caused by the senses. She helps a devotee achieve control over the senses. Chandraghanta is associated with clean and pure mind, which is filled with God consciousness. She helps a devotee in mastering the mind. A person who has control over the mind is always in bliss. Maa Kushmanda is dedicated to victory over the evil thoughts that rise in the mind. She crushes all kinds of unwanted desires that make life unhappy. She uproots illusion or Maya. Skanda Mata protects the godliness and goodness in the mind of a devotee. She nourishes good thoughts in the mind of a devotee. She takes care of children. She nourishes both physically and mentally. Maa Katyayani represents Sattva Guna among the three gunas. Dharma - love – compassion – empathy. She helps a devotee to understand the tough terrain of worldly matters. She helps her children flourish on earth. Goddess Kalratri she annihilates all that forces that rise against the Sattva Guna. She protects the Sattva Guna and Dharma. She devours all those that try to unsettle Dharma following children of hers. She is the guardian of all those who follow Dharma. Mahagauri resides in a person who is filled with Sattva Guna and Dharma. The halo that appears around such a person is the representation of Mahagauri. She is the one who helps a devotee to settle worldly matters and enter the world of spirituality. A devotee successfully completes his/her duty in the world and enters into the life of dispassion and contemplation. Goddess Siddhi Dayini or Siddhidatri represents self-realization. The ultimate objective from which there is no return to the world of birth and death. She helps a devotee escape the endless cycle of birth and death. Please note that these are my findings and there can be more hidden symbolism and meaning to the each aspect of Mother Goddess.